How Can I Make My Fills Sound More Full? I've been playing drums for a few years, just teaching myself. A lot of drummers I see only use one mounted tom, usually the bigger of the two toms. I was wondering if you could tell me why that is? I'm into punk and screamo kinda drumming and it seems to be these bands that do it, like Travis Barker from Blink 182. Is it because they don't feel the need to use two mounted toms? I find if the two toms are there I use them both but if I just put the one on there I find my fills don't sound as full. Yet other drummers who only use the one mounted tom make their fills sound fuller than what mine do with two mounted toms! I would love to be able to drum with just the one mounted tom, I think it would give me more time to focus on other parts of the kit, but why do my fills sound so empty? Maybe using two floor toms makes up enough of the low end in the opinion of some drummers who use only one tom. I have no way of knowing why your fills do not sound "full" without hearing you play. What do you mean by "full"--is it the density of notes or the tone of the drums? Have you tried using two floor toms? That, coupled with the use of lower pitched toms would tend to make fills sound fatter. 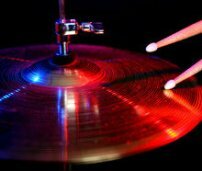 If you are having trouble composing fills, you could try copying EXACTLY the fills used by some of your favorite drummers. That would give you some new ideas. You might want to try our Almost Free Drum Tabs. Then you could find out if the problem you are experiencing with your fills is a SOUND issue or a COMPOSITION issue.